Dzama tells stories. Stories about bad men like terrorists, decadent stories about a world where dancers and cowboys and all kind of puppet-like creatures roam. His world is one big theater. The stage element is important. Hence he also directs movies and performances and creates sets and decors, thus moving his drawings and paintings into the real world. Marcel Dzama’s work is characterized by an immediately recognizable visual language that draws from a diverse range of references and artistic influences, including Dada and Marcel Duchamp. While he has become known for his prolific drawings with their distinctive palette of muted colors, in recent years, the artist has expanded his practice to encompass sculpture, painting, film, and dioramas. Dzama was born in 1974 in Winnipeg, Canada, where he received his B.F.A. in 1997 from the University of Manitoba. Since 1998, his work has been represented by David Zwirner. The artist has had eight gallery solo exhibitions, including Puppets, Pawns, and Prophets which was his ﬁrst presentation at the London location in 2013 and was accompanied by a fully illustrated catalogue co-published by Hatje Cantz, with an essay by Deborah Solomon. In 2014, David Zwirner presented a solo exhibition of Dzama’s work at the gallery in New York, which marked the United States debut of his latest film Une danse des bouffons (or A jester’s dance). On view October 5 through November 12, 2016 at THE UPPER ROOM at the gallery’s London location will be a two-person exhibition with Raymond Pettibon. This presentation follows their show earlier this year at David Zwirner, New York. The New York City Ballet’s The Most Incredible Thing, a performance based on Hans Christian Andersen’s fairy tale for which Dzama created the costume and stage design (choreographed by Justin Peck; music by Bryce Dessner), premiered in February 2016. Coinciding with the performance, Dzama created an installation in the Promenade of the David H. Koch Theater as part of the New York City Ballet Art Series, titled The tension around which history is built. 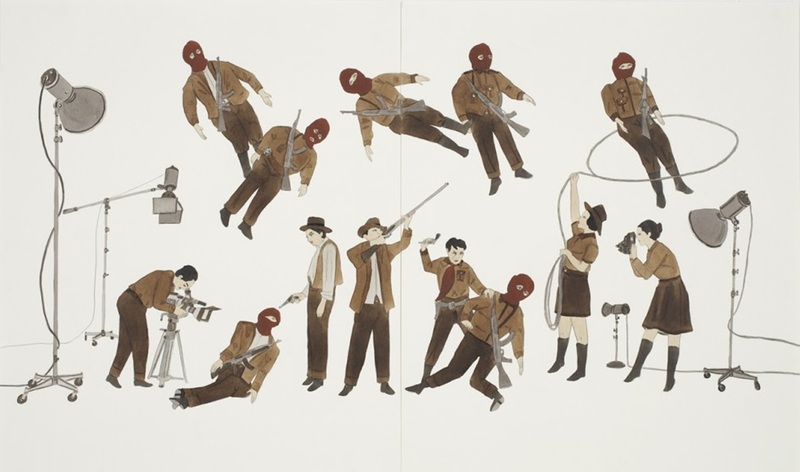 Since the late 1990s, Dzama has exhibited widely in solo and group presentations throughout the United States and abroad. In 2015, the artist’s film Une danse des bouffons (or A jester’s dance) was presented alongside related two- and three-dimensional work in a solo show at the World Chess Hall of Fame in St. Louis. In 2010, a major survey of the artist’s work was held at the Musée d’art contemporain de Montréal in Montreal. Other recent solo exhibitions include those organized by Kunstmuseum Thun, Switzerland (2014); Galería Helga de Alvear, Madrid (2013); Centro de Arte Contemporáneo de Málaga, Spain; Museo de Arte de Zapopan (MAZ), Zapopan, Mexico; World Chess Hall of Fame and Museum, St. Louis (all 2012); Gemeentemuseum, The Hague; Kunstverein Braunschweig, Germany (both 2011); Pinakothek der Moderne, Munich (2008); Ikon Gallery, Birmingham, England (2006); and Le Magasin – Centre National d’Art Contemporain de Grenoble, France (2005). In 2013, Abrams published the first comprehensive monograph of the artist’s work, titled Marcel Dzama: Sower of Discord. Produced and designed in collaboration with the artist, it features contributions by Bradley Bailey, Dave Eggers, Spike Jonze, and Raymond Pettibon. Work by the artist is held in museum collections worldwide, including the Corcoran Gallery of Art, Washington, D.C.; Dallas Museum of Art; Musée d’art contemporain de Montréal; Museum of Contemporary Art, Los Angeles; The Museum of Modern Art, New York; National Gallery of Canada, Ottawa; Solomon R. Guggenheim Museum, New York; Tate Gallery, London; and the Vancouver Art Gallery. Dzama lives and works in Brooklyn, New York.